It seems like Les Miserables has been following me lately. 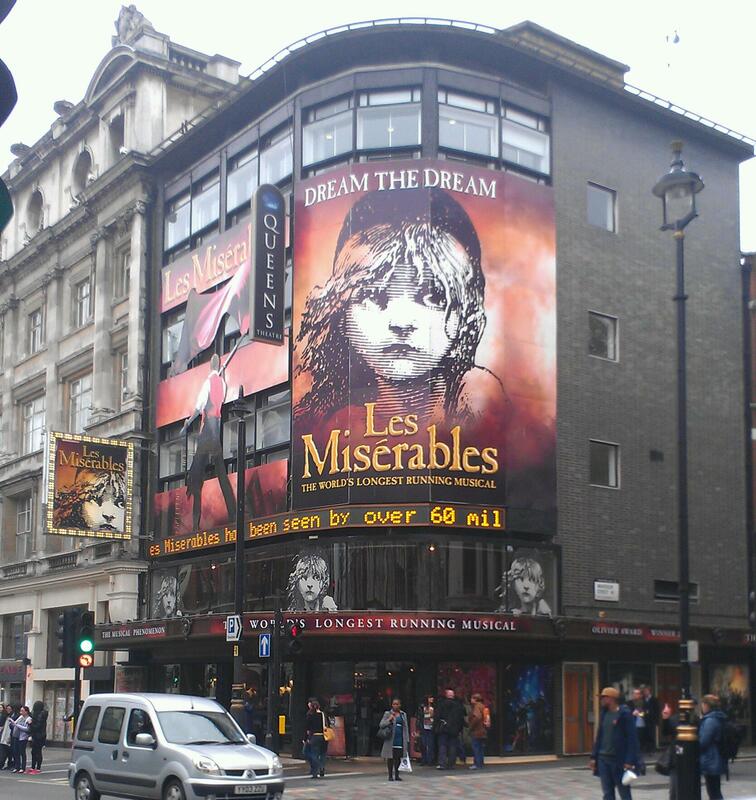 Not only did I go see this production in London, but at the very same time, the US tour was in St. Louis. Also, the movie will be released in a few weeks, and the Muny recently announced that the show will be part of their 2013 summer season. I’m not complaining—I love this show and I have since the 1980’s when Les Mis was brand new and I was in high school, listening to the London and Broadway cast albums on my friend’s Walkman on the school bus and singing along with the Broadway CD at home with my brother. Those days are a distant memory now, but my fondness for the show endures. I was so glad to be able to see the London production because, as far as the English language production goes, that’s where it all started. Even though the show is one of my all-time favorites and I’ve heard several cast recordings and seen both televised anniversary concerts as well as numerous YouTube clips, I didn’t get to see it onstage until the Muny’s production in 2007, which I saw twice and loved. Still, seeing it in London was special for many reasons, not the least of which is the incredibly high caliber of the current cast, including two of my favorite performers and several highly talked-about performances. It’s also Les Mis in London, with mostly the original staging, but it still seems fresh and vibrant even 27 years into its run. As much as I’ve loved the musical, I never got around to reading the novel until this year, and I’m glad I did because it enhanced my appreciation of the show. It was fun to watch the show and think of all the little elements from the novel that show up in the various performances, particularly from this cast. It was also great to watch the show as originally staged and see how well the atmosphere is set–following Jean Valjean (Geronimo Rauch) on his journey from the chain gang to small town mayor to Paris in the midst of the student rebellions. I think this show has been popular so long because of its enduring themes of loss and redemption, struggle and hope, faith and love, and this current production communicates those themes extremely well. The cast is simply amazing. This is a show that’s had so many people in the various roles over the years but the current casting more than lives up to the show’s illustrious reputation. It’s a “dream cast” as far as I’m concerned, and I felt honored to be able to see them. Geronimo Rauch, who had previously played the role in Spain, plays Jean Valjean with strength, energy and real compassion, and his voice is strikingly clear and strong. His moments with Fantine and Cosette are very convincing, and “Bring Him Home” is beautiful. He is well-matched by Tam Mutu as the rigidly determined Inspector Javert. I loved their performance of the “Confrontation” with all of the energy and depth. Mutu brings a real depth and humanity to Javert that is evident in his solo numbers and interactions with his fellow cast members. Sierra Boggess, who played Christine so remarkably in the 25th Anniversary performance of Phantom of the Opera, appears in this production as Fantine, and she brought out the character’s desperation and fragility in a way that I had never seen before. Her death scene was hauntingly tragic, and she brought both power and gut-wrenching emotion to “I Dreamed a Dream”. Boggess is more of a traditional soprano than most actresses who have played Fantine, but her voice worked well, highlighting the emotions of the character. Danielle Hope is an outstanding Eponine, bringing out the full emotional range of the character in a performance that is very true to the novel. Hope has a particular gift for allowing the audience to see the character’s thoughts very clearly, without uttering a word. Her scenes with Marius and her reactions to his attentions to Cosette (Samantha Dorsey) are especially remarkable. “On My Own” is amazing and “A Little Fall of Rain” is heartbreaking. Her Eponine is simultaneously tough and vulnerable, single-minded, intense and even a little crazy, which is marvelous. Craig Mather is also a standout as a particularly compassionate Marius. His “Empty Chairs At Empty Tables” is stunning, and he has excellent chemistry with his co-stars, especially Dorsey and Hope. Adam Linstead is also excellent as the saintly Bishop and the student Grantaire, bringing strength and sympathy to both characters. I also saw Linstead as Thenardier the second time I saw the show, and he was excellent in that role as well, highlighting the comic aspects of the character in contrast to principal Thenardier Cameron Blakely’s darker (and also excellent) portrayal. I also got the chance to see two different actresses as Madame Thenardier–Nicky Swift (the understudy) on the first night I saw the show and Linzi Hateley (the principal) the second night. Both were excellent, with Swift coming across as more earthy and Hateley as more over-the-top villainous. There was also a top-notch ensemble that was in great voice both nights, doing justice to the wonderful score of this remarkable show. I especially loved “One Day More”, the barricade sequences and the finale in terms of ensemble singing. Seeing the original staging of this show was a delightful experience. I loved the giant barricade set especially, and was tempted to applaud when it came together dramatically at the beginning of the second act. I also liked the extensive use of the revolve and how everything was in constant motion as the story took us from setting to setting as the story unfolded. It was also great to hear the spectacular music played so well by the show’s orchestra. The time, place and mood of the show and its various settings were vividly realized, and even though I knew the show well, I felt transported to 19th Century France. It’s great to see such a long-running show in such a a vibrant production, still being played as if it is brand new. I could go on writing every little detail about this production, but I won’t because this entry would be far too long. I love this show so much that anything I write seems inadequate, and it was a joy to get to see it in London with this wonderful cast. It more than lives up to 27 years of hype, and it deserves to run for many more years. The tagline for this show is “Dream the Dream”, and after all these years, the dream is still going strong. A lot of people seem to be questioning why all the artists involved in this benefit are putting so much time and effort into helping out a business when they could be putting that same time into helping various charitable causes. I already mentioned in “Save Dress Circle 2” that many of these artists already do a lot to support charities and it’s not a case of “either/or”, but I thought of an analogy that I think might explain why a lot of these artists are doing this, and why I and many other theatre fans are supporting this cause. The bottom line for me is that it’s not about helping a business vs. helping a charity. It’s about helping a friend. If someone has a good friend who owns a business that is struggling, would they just say “tough luck. That’s the way things go these days, with this economy, and you should have worked harder to save it yourself. “ I don’t think most people would do that. They would help their friend in whatever ways they could—they would patronize their business and tell other friends about it. They might even donate their time and/or money to help their friend find ways to keep their business afloat. If that friend has been there for them in hard times as well as in good times, they would want to return the favor. This, I think, is what is happening with Dress Circle. I can’t read minds, but what I see from the words and actions of the performers, fans and others involved is that they don’t see Dress Circle as just some shop. They see it as a friend, and they want to do whatever they can to help their friend. What has Dress Circle done, you may ask, to have all these people want to help them like this, as if they are an old friend? Dress Circle has supported them when they needed support, in terms of selling and promoting performers’ solo CD’s when the big chain stores wouldn’t. They’ve also been there to hold signings to help promote West End shows as well as the individual performers. Also, they are there as a place to go for theatre fans and creatives to meet and promote whatever is going on in the industry, from small fringe venues to the West End and everything in between. They see Dress Circle as a place with people who understand them and will work to promote them and the industry that they love. It’s not just about someplace to buy CDs or books. That is an important aspect of it, but there is a lot more to it than that. These people—artists, creatives, fans and whoever else—seem to feel that this particular shop is more than just a shop. Dress Circle has been there for them when they needed support in their careers, and they want to return the favor. They love Dress Circle, and see it as a friend, and they would like to see their friend stick around. That, to my mind, is why this effort is going on. It is not about making a business into a charity or taking away funds and/or time that can be devoted to charities. It is about real, genuine affection for an institution that has come to be seen as a dear old friend, and these people want to help their friend. I see nothing wrong with that, and indeed I share the sentiment. I have been to Dress Circle, the actual shop, only twice, but I’ve long been a member of their online message board, and I have seen all the efforts they have made to support and promote theatre and individual artists. I feel like this organization has been a real friend to the theatre industry and it would be a shame to see them go under, so I support this cause. I really wish I could attend the concert, but there has been talk of a CD of the event and if there is one, I will gladly buy it. I send my best wishes to all who are involved in this benefit and to Dress Circle itself. This shop has been a true friend to the theatre community, especially in London but also around the world, and I hope it stays around for a very long time.